Mono vs. Poly WAV Files: What’s the Difference? Certain high-end professional audio recorders have options for either WAV, WAV Mono and WAV Poly (polyphonic) files. What’s the difference and what should your choice be? Know the difference between these WAV file types before beginning a project. Your pick often depends on the use of the sound being recorded. WAV Poly files are multi-channel BWF files that contain extra metadata identifying the channels. 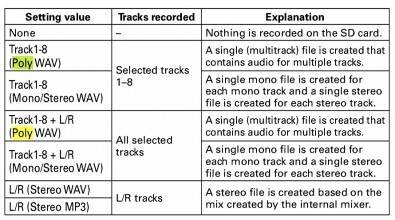 With WAV mono (monophonic) as the file type, the audio recorder will generate separate data files for each individual track recorded. Many DAWs and audio programs are able to import WAV Poly files directly or to split them up into their component mono WAV files. Most suites for editing film dialog will ask for WAV Poly-files, which is an alternative word for interleaved audio files. The advantage of WAV Poly is that you have fewer files to deal with and single legs won’t get lost. Poly is often chosen simply because there is a single file. The best policy is to always ask which file type is preferred before the shoot. There is no correct answer to the choice. Just find out the editor’s preference and stick with it. Otherwise, you might find yourself having to convert files. The poly files generated by Sound Devices 7-Series recorders have file names similar to T01.WAV, no matter how many tracks are contained within the file. When generating mono files, these recorders have file names similar to T01_1.WAV and T01_2.WAV. The _1 and _2 after the take numbers are the mono designators added to the file name. These represent individual tracks. Zoom’s new F8n eight-channel recorder also has a choice of WAV mono or poly files. But it also adds the choice along with L+R channel recorded tracks along side the other tracks. For users who want to convert the format they chose, Sound Devices offers a free software application called Wave Agent, a file conversion utility for Macintosh and Windows-based computers. The app will convert WAV files between monophonic and polyphonic formats. Designed for production sound mixers and post production editors, the utility provides a comprehensive range of tools for preparing audio files for problem-free passage through complex production workflows. The app can playback up to 32 tracks of polyphonic or monophonic Broadcast WAV files and standard WAV files from any source. The playback mixer provides multi-channel monitoring, metering and mixing of tracks. It can split WAV Poly files into mono files, or join separate, related WAV Mono files into a single WAV Poly file. It can also edit, rename and convert one or multiple WAV Mono or Poly files with the batch editor.